Product prices and availability are accurate as of 2019-03-15 13:29:10 EDT and are subject to change. Any price and availability information displayed on http://www.amazon.com/ at the time of purchase will apply to the purchase of this product. 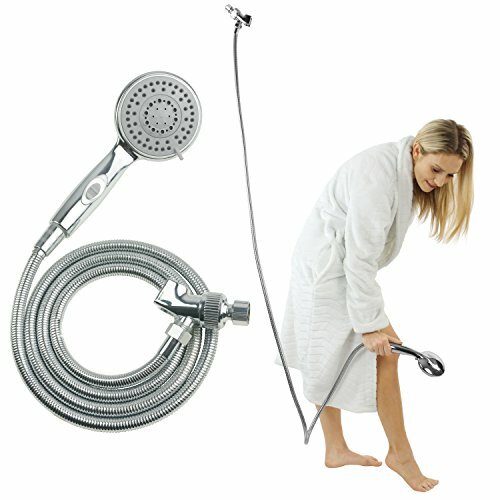 Featuring a tangle-free hose and multiple spray settings, the Vive Handheld shower head provides luxury and convenience. Easily switch modes with a single lever switch or use the pause feature to maintain water temperature. 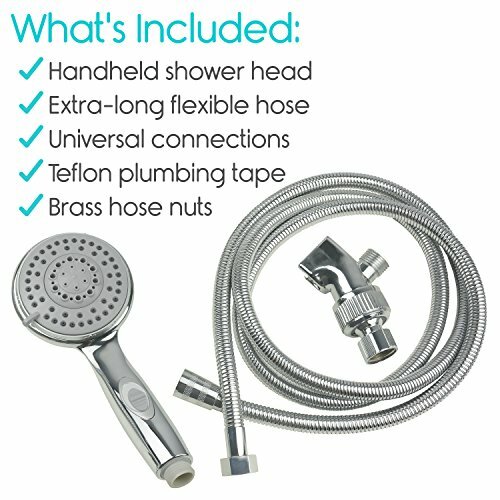 Handheld shower head is 4" in diameter and comes with brass hose nuts for easy hand-tightening and Teflon plumbing tape for added convenience. The transition to a convenient handheld shower head is quick and hassle free. Fitted with universal connections, the Vive handheld shower head easily fits any standard shower plumbing fixture. Versatile handheld shower head features five spray modes including saturating spray, massaging spray, bubble spray and two combination sprays: saturating and massaging, and saturating and bubble. A convenient pause feature allows the high pressure flow to be slowed to a trickle while maintaining temperature settings when necessary. 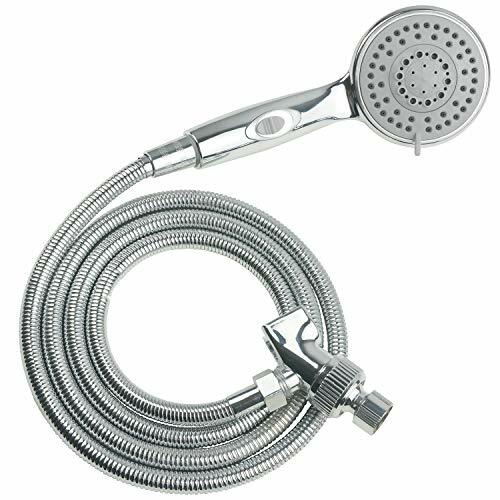 Easily showering on a stable shower chair, bathing children or even pets, the tangle-free stainless steel shower head hose is 6.5' in length, allowing maximum flexibility and convenience. 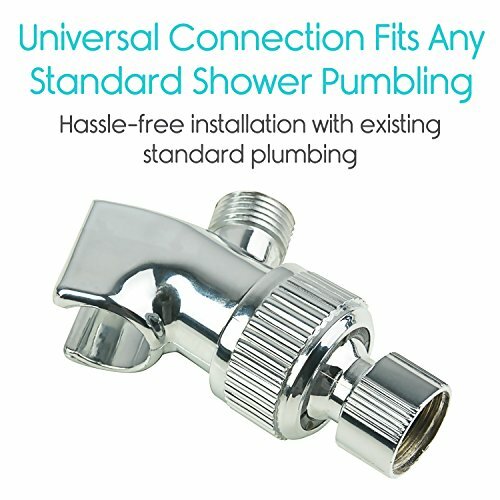 FITS ANY STANDARD SHOWER PLUMBING: Universal connections allow the Vive handheld showerhead to easily fit any standard shower plumbing fixture. 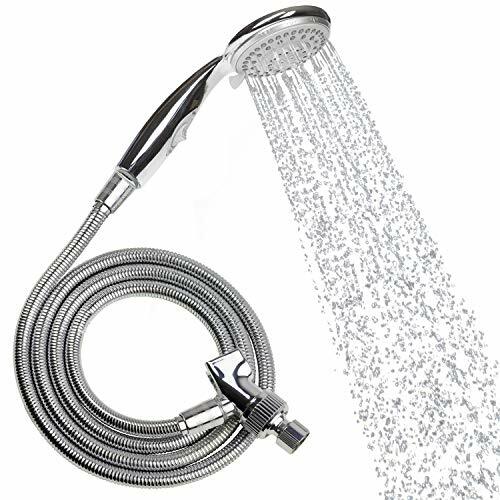 FLEXIBLE, EXTRA-LONG HOSE: Easily showering on a stable shower chair, bathing children or even pets, the tangle-free stainless steel shower head hose is 6.5' in length, allowing maximum flexibility and convenience. MULTIPLE SPRAY SETTINGS: Versatile shower head features five spray modes including saturating spray, massaging spray, bubble spray and two combination sprays: saturating and massaging, and saturating and bubble. A convenient pause feature allows the high-pressure flow to be stopped while maintaining temperature settings. TOOL-FREE INSTALLATION: Everything is included for easy tool-free installation. 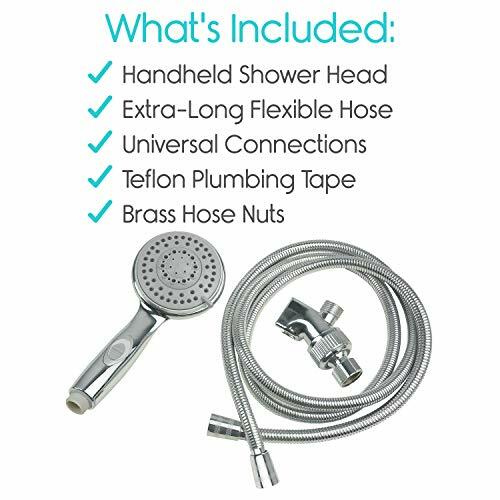 Handheld shower head is 4" in diameter and comes with brass hose nuts for easy hand tightening and Teflon plumbing tape for added convenience. The transition to a convenient handheld shower head is quick and hassle free. VIVE GUARANTEE: Unconditional lifetime guarantee so you can purchase now with confidence.